With the High / Low Indicator, you will be able to identify support and resistance levels in a specific timeframe using MetaTrader 4 platform. With this indicator you can select Hourly, 4 Hourly, Daily, Weekly and Monthly High / Low positions. 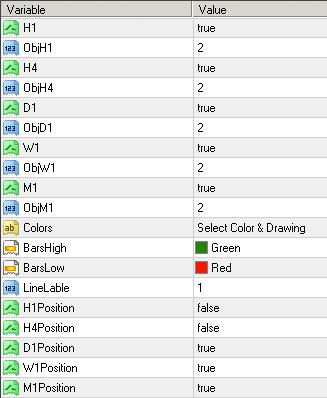 You can set colors, labels and how to draw the High / Low lines. High / Low levels are usually good to have a quick view of support and resistance price levels. You can use these levels to predict price bounces or breakouts.